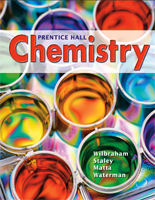 Prentice Hall Chemistrymeets the needs of students with a range of abilites, diversities, and learning styles by providing real-world connections to chemical concepts and processes. The first nine chapters introduce students to the conceptual nature of chemistry before they encounter the more rigorous mathematical models and concepts in later chapters. Animations, Simulations, Assessment, and Problem-solving tutorials.